Introducing LED Lenser’s latest masterpiece; the LED Lenser M7 (8307) Micro Processor Torch (Gift Box). Modelled from the insanely successful LED Lenser P7 (8407), the LED Lenser M7 includes a Micro-Processor controlled multi-mode switch and gives off an incredible 225 lumens from a mere four AAA batteries! The M7 truly is one of the best torches that you will ever own. 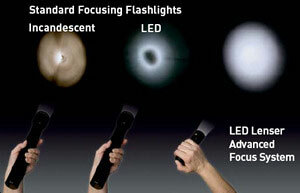 It comes with LED Lenser’s spot to flood beam advanced focus system (pictured above) and a quality clip attachment to attach to something such as a belt. Featuring a high intensity CREE LED Light chip and lightweight aircraft aluminium casing, the M7 as previously mentioned gives up to a dazzling 225 lumens and from the four AAA batteries required for its use (included) it has a burn time typically of 126 hours on low power lighting modes. As pictured above the LED Lenser M7 has an effective range of up to an astonishing 700ft, due to the fact it packs a punch with 225 lumens. You may want to take a moment and breathe in after hearing all of this but simply, the M7 is quite an astonishing torch that will last a lifetime, as LED Lenser only make quality reliable and long lasting torches. At this moment you may be thinking that this torch will have you out of pocket for months, but you’ll be pleasantly surprised to hear that we are currently selling the LED Lenser M7 for an astonishing £55.80 inc VAT! As if this low price wasn’t enough were also offering free delivery at the moment with every purchase of the M7, so get buying while stocks last! If you however need something simply more powerful than the M7, such as the LED Lenser X21 (8421) Xtreme Torch, or something more specialist such as the LED Lenser D14 Frogman (7457) Diving Torch, check out our LED Lenser Range on our Online Shop.